With a little planning, you can catch many of the park’s highlights while leaving yourself enough time to bask in the silence of the desert and pamper yourself at the resort. So here you are, staying for a long weekend at The Oasis at Death Valley, a world-class resort surrounded by Death Valley National Park. 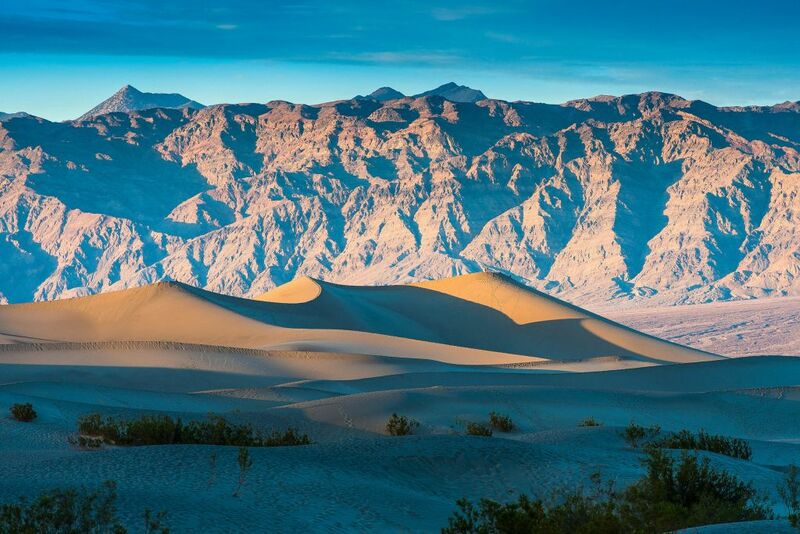 A vast expanse that’s bigger than two states and the District of Columbia, Death Valley is the Lower 48’s largest national park, and you’ll no doubt want to explore as much of its diverse and rugged desert terrain as possible. But you probably also hope to kick back and relax on the grounds of the resort’s two newly renovated hotels: the luxurious and historic four-diamond Inn at Death Valley and the family-friendly Ranch at Death Valley. The reality is that it would take a lifetime to see all of Death Valley, a park that ranges in elevation from Badwater Basin, the lowest point in North America at 282 feet below sea level, to the snowcapped heights of 11,049-foot Telescope Peak in the Panamint Range. There are expansive salt flats and intimate, serpentine canyons, plus geological features from volcanic craters to sand dunes. And given the right conditions, Death Valley can put on spectacular displays of spring wildflowers. That’s a lot of ground to cover. But with a little planning, you can catch many of the park’s highlights while leaving yourself enough time to bask in the silence of the desert and pamper yourself at the resort. Here’s how. 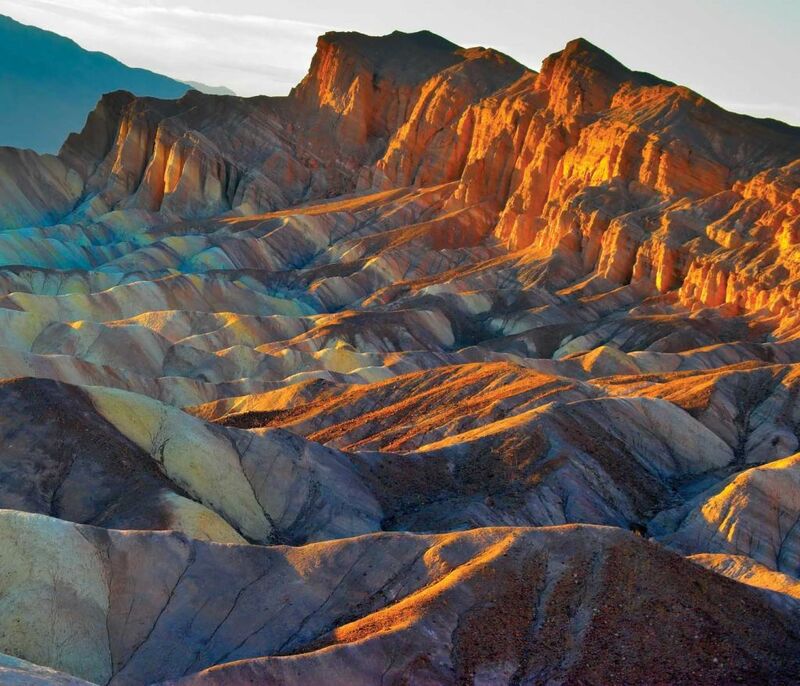 Less than a 10-minute drive from the resort, Zabriskie Point might just transform even the most stubborn of night owls into a morning person. That’s because this overlook offers the definitive sunrise view in the park as the badlands below the point come aglow with the first light of day and the Panamint Range across the valley fires with pinks and reds. Watch the display and then take a short drive on an unpaved road (suitable for standard vehicles) through the jagged badlands of nearby 20 Mule Team Canyon. From the end of the one-way road, it’s a quick hop back to the beautifully restored Inn Dining Room, where you’ll find historic Western art and a breakfast menu of regionally inspired specialties — from huevos rancheros to 49’er flapjacks served with Deglet Noor date butter. Over at the national park’s Furnace Creek Visitor Center, you can learn about the region’s natural and human history and also catch a beautifully produced 20-minute film narrated by actor Donald Sutherland that illuminates Death Valley’s grandeur. For more history, stop at the ranch to visit the Borax Museum. Housed in the valley’s oldest structure, which dates to 1883, the museum exhibits an impressive mineral collection and looks at the role that borax, a mineral used in ceramics and a host of cleaning supplies, played in Death Valley’s development. Behind the museum, you’ll also find historic mining equipment, wagons, and locomotives on display. While you’re at the ranch, pick up a cup of coffee and enjoy the park-like setting of its reimagined town square. 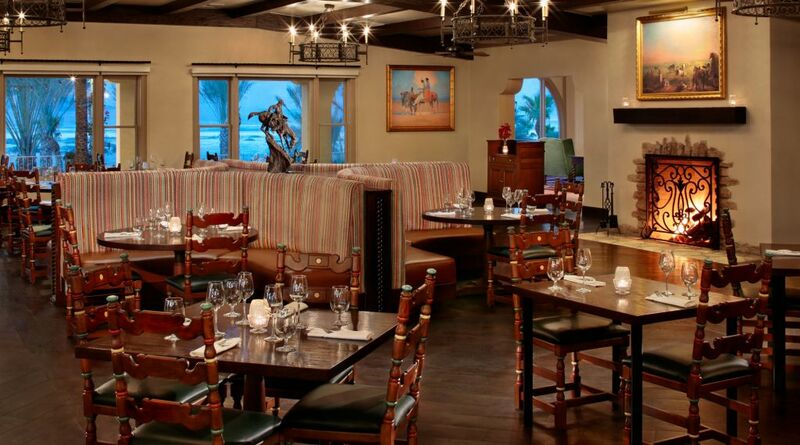 Built in a Spanish Colonial Revival style with beautifully landscaped gardens, the square is lined by newly constructed buildings that house the resort’s general store, a Western-style restaurant, and The Last Kind Words Saloon. Hang out by the inn’s landmark spring-fed pool, which maintains a steady temperature in the mid-80s, and enjoy the serene setting as you dine on sandwiches, wraps, and salads at the Inn Pool Café in a beautiful cabana with spectacular views. Head south from the resort for the classic drive down Badwater Road. Take your pick of short hikes just off the road, including the easy 1-mile round trip to Natural Bridge, an eroded stone formation that spans a narrow canyon. For a slightly longer trek, explore the starkly beautiful terrain of Golden Canyon, where a 3-mile round trip leads to Red Cathedral, a spectacular ruddy-hued natural amphitheater tucked into a side canyon. Most people make the drive to visit Badwater Basin for the novelty of visiting the continent’s lowest point. For perspective on how low Badwater actually is, look up on the towering cliffs opposite the parking lot for a small sign that marks sea level. And give yourself time at Badwater to walk out on the boardwalk that traverses the salt flats. Try to time your return drive to the resort for late afternoon. That’s the best time of day to take a detour along 9-mile Artist’s Drive to see the most colorful spot in the entire park: Artist’s Palette. With red, pink, purple, and turquoise hues coloring the rock, this remarkable formation definitely lives up to its name. Savor an elegant dinner at the Inn Dining Room, where you’ll face tough decisions not only between such entrees as Wagyu ribeye in a tomato and Andouille demi-glace and port-braised prime beef short ribs, but also about where you want to sit. While the Southwest-style dining room certainly has a relaxed and romantic elegance, a table out along the veranda on a perfect Death Valley night with beautiful views is positively unforgettable. Along with sunrise at Zabriskie Point, the other classic Death Valley morning experience is a walk in the billowing Mesquite Flat Sand Dunes near Stovepipe Wells. The morning light paints the sands with delicate golds and pinks and also accents the ripples etched into the slopes by the wind. It’s also fun to look for animal tracks pressed into the dunes by an assortment of Death Valley creatures including coyotes, desert kit foxes, and kangaroo rats. On the way back to the resort for breakfast, take a detour for a walk along the boardwalk at the Salt Creek Interpretive Trail. Look into the spring-fed creek’s waters, where, especially during the spring mating season, you’ll see tiny Salt Creek pupfish, rare creatures that survive from the days when water covered Death Valley. After lunch at The 19th Hole, which offers burgers and sandwiches overlooking the golf course, head north to see three classic Death Valley sites. Reopened after a nine-year safety-related closure, the restored Keane Wonder Mine off the Beatty Cutoff preserves a major gold mining operation that dates to the early 1900s. In addition to seeing remnants from mining days, you can follow a trail that steeply climbs past the towers of the mostly intact aerial tramway. Back on the main Death Valley road, drive up to Ubehebe Crater in the northern reaches of the park for your chance to walk along the rim of a 600-foot-deep volcano that erupted about 2,100 years ago. If you’re up for a bit more hiking on the way back, a short drive off the highway on a gravel road leads to the mouth of Titus Canyon. From the parking area, you can hike into the canyon’s narrows, where the soaring walls rise hundreds of feet but close to less than 20 feet across. If you have a four-wheel drive vehicle, you can drive through the Canyon, but it’s one way so be sure to enter in the right direction. Before enjoying dinner at the Inn Dining Room or at the Ranch, savor every last minute of the day on a sunset or moonlight horseback ride along the valley floor with Furnace Creek Stables. For a nightcap, the lobby bar at the inn is an elegant spot to toast another great Death Valley day. The panorama is positively heavenly from Dante’s View, an overlook about 40 minutes south of the resort. At 5,475 feet in the Black Mountains, Dante’s View is literally more than a mile above the salt flats and takes in a spectacular vista looking north across the full sweep of the valley. Hike along the network of trails to get different perspectives for photographs. The morning is also an ideal time to test your game on the Furnace Creek Golf Course at Death Valley, the world’s lowest elevation golf course at 214 feet below sea level. Around here is more than just a novelty because the challenging course earned a spot on Golf Digest’s list of America’s toughest courses. And not only are there birdies, there are also birds: The Audubon Cooperative Sanctuary System designated the eco-friendly course as a certified natural sanctuary. After lunch, you’ll have to decide just how ambitious you want to be. By this time in the trip, you’ve no doubt spent time behind the wheel. If you’d rather leave the driving to someone else and still get out to some of the park’s more rugged and remote destinations, Farabee’s Jeep Tours leads guided outings to such spots as Racetrack Playa and through Titus Canyon. Of course, you also have the option of indulging in a little rest and relaxation. For the ultimate in pampering, reserve a poolside cabana at the Inn and treat yourself to a desert hot stone massage in one of the spa’s two treatment rooms overlooking the Oasis gardens. 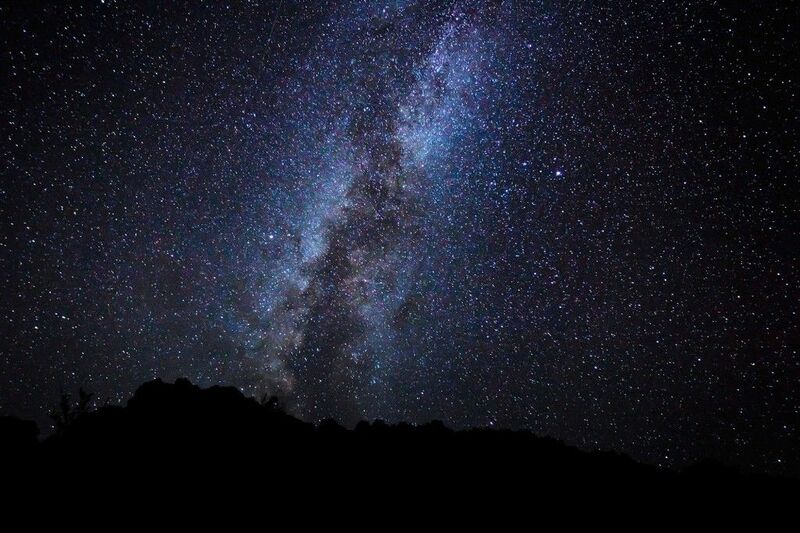 Enjoy your final dinner at the Inn Dining Room, then find a spot away from any lights for stargazing and you’ll soon discover why Death Valley earned recognition as the country’s third International Dark Park from the International Dark-Sky Association. You won’t need any special optics (binoculars are fine) to bear witness to the brilliance of the Death Valley sky. But in winter and spring, park rangers and experts from local astronomy organizations conduct stargazing events with high-powered telescopes. The Oasis at Death Valley in Furnace Creek is situated in a lush oasis surrounded by the vast and arid desert of Death Valley National Park — just 120 miles northwest of Las Vegas and 275 miles northeast of Los Angeles. The resort encompasses two hotels — the historic AAA Four Diamond, 66-room Inn at Death Valley and the family-oriented, 224-room Ranch at Death Valley. The entire resort is undergoing a complete renaissance with an extensive renovation to be completed in the fall of 2018. The resort includes natural spring-fed pools, an 18-hole golf course, horse and carriage rides, world-renowned stargazing, and is surrounded by Death Valley National Park’s main attractions. For information and reservations, visit oasisatdeathvalley.com or call 800-236-7916.